We finally got the chance to get behind the wheel of the new Chevrolet Colorado ZR2 Bison! It’s the absolute off-road beast you’d expect it to be. And it comes in at a price point a bit lower than we expected. Come January, you’ll start seeing a new truck on dealer lots: the Chevrolet ZR2 Bison. And despite serious adventure chops, it starts at $48,045. Last month, I got the chance to drive a V6 crew cab ZR2 Bison on the streets of Scottsdale, Ariz., and in the mountains nearby. It met every expectation I had. Let’s dive into the details on this impressive factory-prepared off-road machine. First off, while this is for sure an off-road-oriented truck, it performs extremely well on pavement. The Multimatic shocks really help the truck stay flat in cornering and feel planted at speed. Speaking of speed, this truck easily cruises at about 75 mph. With the V6 and eight-speed transmission, it pulls pretty hard all the way to 90 mph but then feels pretty gutless before hitting the computer-limited speed of just under 100 mph. But off road is of course where the new Bison truly shines. While it only has 31-inch tires, it has no problem getting through — and over — relatively large off-road obstacles. We put the rock sliders and skid plates to the test on our drive, and they performed flawlessly. They both allowed the vehicle to make it through rough terrain and protected the body and mechanicals from any impact damage. The new Bison front bumper from American Expedition Vehicles doesn’t restrict cooling, which is an issue with other aftermarket off-road bumpers on the ZR2. The drawback to not blocking air flow to the radiator and having an integrated winch mount is that the bumper sits a bit lower than the standard ZR2 bumper. This, of course, reduces the entry angle, but just ever so slightly. My only real complaint off pavement was the harsh ride at slow speeds over small rocks. I believe this to be due to the way the Multimatic dampers work. In addition, we were driving on full street air pressure for the drive. If you air down (like you should for off-road driving), the softer tires will help provide a much more comfortable ride in rugged conditions. The one downfall for the diesel ZR2 Bison is that the exhaust tip is too large and hangs too low. It’s easily crushed between rocks and the bumper, something that happened on every diesel ZR2 Bison during the test drive. A Chevrolet Performance part would improve this a ton, but, of course, that adds cost. The throttle pedal response is really good on this truck. The brake pedal has a bit of play but is then smooth and linear. The computer settings will affect both pedals depending on the driving mode you’re in. The off-road mode setting is basically the “fun” mode on this truck. It makes the pedals more linear and responsive, reducing the stability and traction control nannies. A nice feature: You can also turn off all computer aids to take full control. As with the ZR2, the Bison has no manual transmission option and doesn’t offer a push-button start. 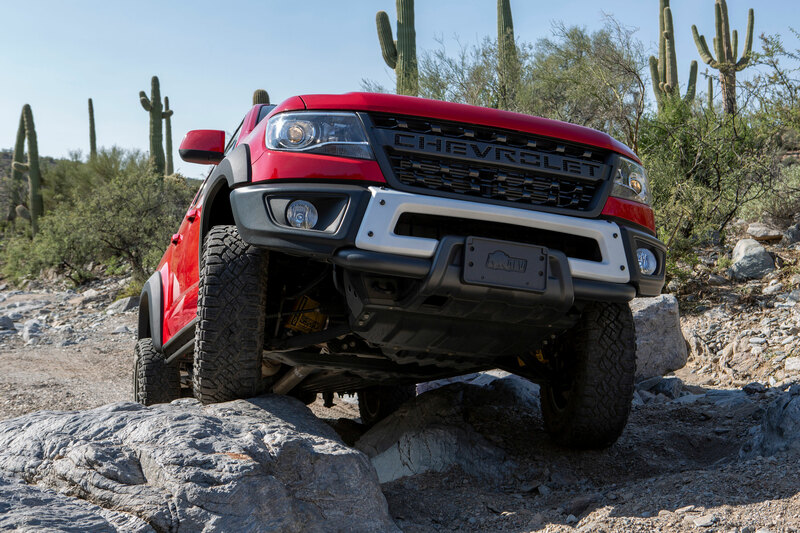 Most of the midsize truck competitors offer both of these options as standard, or at least will soon when new models (think Ranger and Gladiator) hit the market. 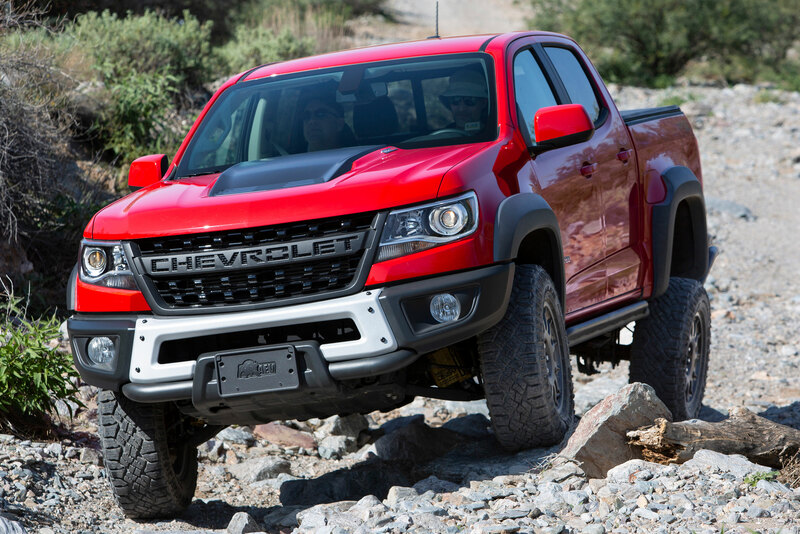 While I fully expected these trucks to cost well over $50,000, somehow Chevrolet and AEV teamed up to get the starting prices just below that number. 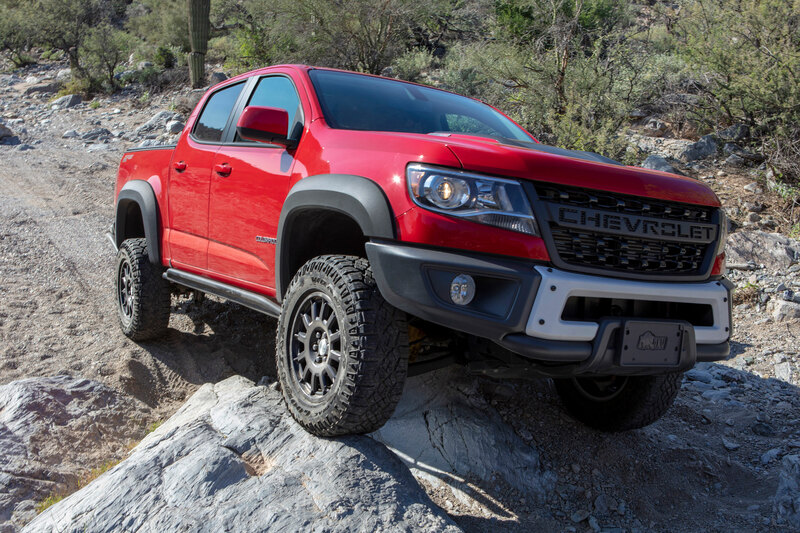 The AEV Bison package adds $5,750 more to a Colorado ZR2. That equates to a starting price of $48,045 for a V6 extended cab and $49,645 for the crew cab. While you can’t yet build out a ZR2 Bison on Chevrolet’s website, I built out a top-spec ZR2 Duramax turbo-diesel crew cab and factored in the price of the Bison package. So if you go all in for a fully loaded truck, you’re looking at about $55,385. Let’s recap what you really get for your money with this impressive off-road truck. 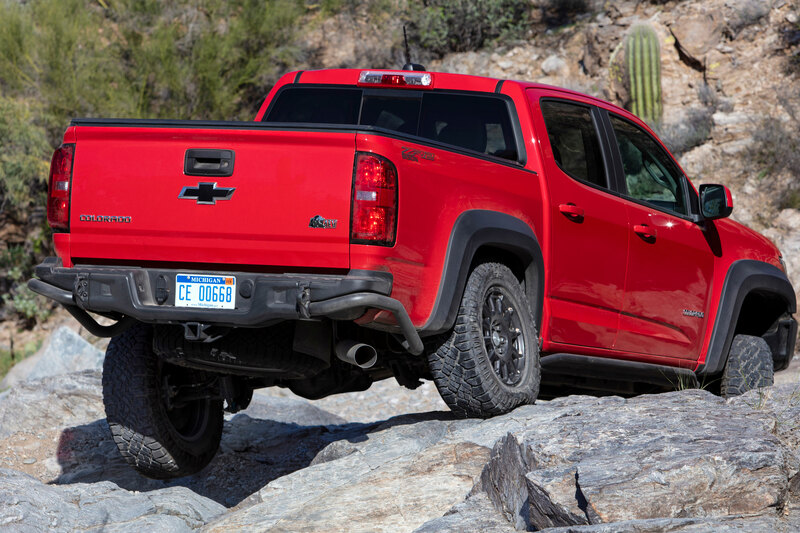 The ZR2 already gives you front and rear locking differentials, Multimatic DSSV dampers, rock sliders, a 3.5-inch wider track width, a 2-inch suspension lift, and a 3.42 rear axle ratio. AEV builds upon this already extremely capable platform with some key upgrades. The Bison edition gets you five hot-stamped Boron steel skid plates, stamped steel front and rear bumpers, flow-through “CHEVROLET” grille, 31-inch Goodyear Duratrac tires, wider fender flares, AEV Bison 17 x 8-inch aluminum wheels, and “Bison” and “AEV” decals on the bedsides, tailgate, headrest, and floor mats. Sure, all those upgrades are impressive, but the real keys to AEV’s Bison upgrades are the details. The front bumper is winch compatible and ready for fog lamps. The rear bumper has built-in recovery points and is also ready for additional integrated lighting. Everything about these upgrades is designed to improve off-road capability while looking good and accepting the other accessories many drivers will add. Still, one of the main items the production Bison is missing that the concept truck featured is the Snorkel. Luckily for us, AEV is making this part. For now, it will be available through aftermarket AEV dealers only. But I have a feeling Chevrolet dealers will stock the snorkel and other AEV parts soon enough. Colorado ZR2 Bison: Well Done, Chevy! Just last month, the Colorado celebrated its four-year anniversary. In those four years, U.S. customers bought more than 428,792, according to Chevrolet. 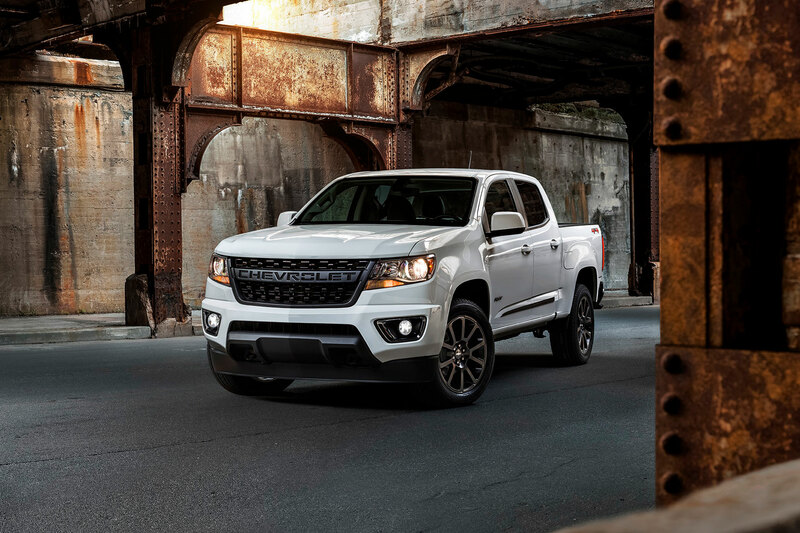 With the introduction of the Bison and two new special editions, Chevrolet hopes to continue its growth in the U.S. midsize truck market. 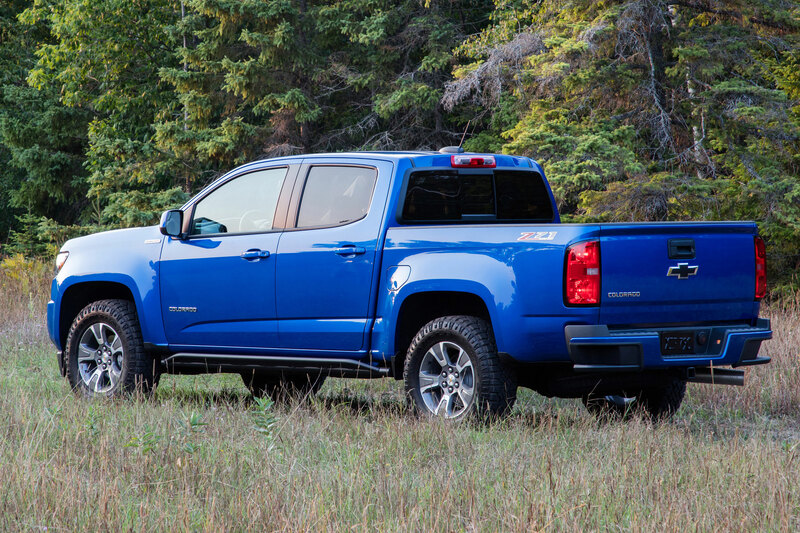 Besides the Bison, Chevrolet also recently announced two special-edition models to celebrate the truck’s four-year anniversary. The new RST is a street-focused truck based on the LT trim Colorado. It sports lots of black accents and 20-inch low-gloss black wheels. 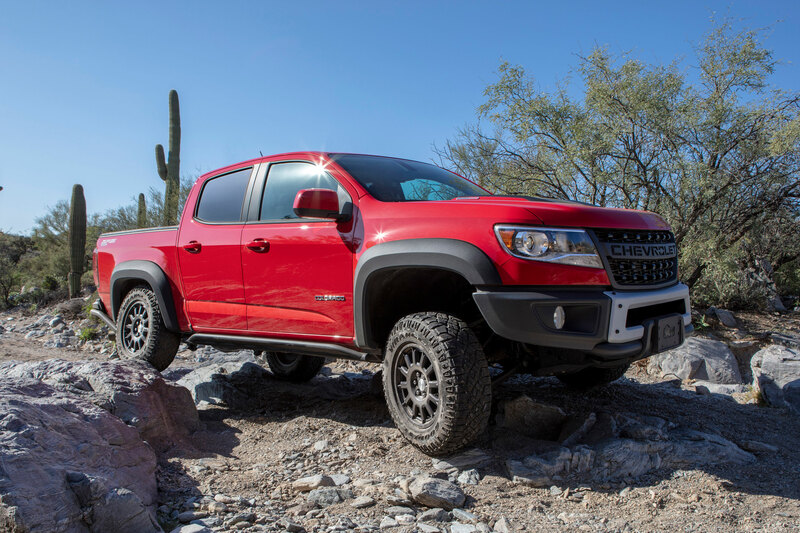 Meanwhile, the Z71 Trail Runner off-road-focused special edition builds off a Z71 Colorado with added underbody protection, rock sliders, and Goodyear Duratrac tires. Both special editions also feature the “CHEVROLET” flow-through grill, which was first shown on the Bison. While these other special editions look good and add some functionality for their intended purpose, it’s hard to top the looks and capability of the Bison. It’s the pinnacle of factory off-road trucks in America. I want one! I’ll take my ZR2 Bison in orange “Crush” in an extended cab with the Duramax Diesel and add the optional snorkel. Please, Santa, pretty please!